Robinhood, an intriguing new smartphone app-based brokerage firm that offers free stock trades, has finally come to Android. Robinhood, a Google Ventures-backed broker firm, launched its iPhone app in December 2014 and followed up with an Apple Watch app in April 2015. The idea behind the company is appealing – it’s a tech-focused firm that cuts out the middlemen in the trading process, executing electronic trades at virtually no cost. Market orders, limit orders, stop loss orders and stop limit orders can all be made any time you want via the Robinhood app. Rather than make its money by charging for each trade, Robinhood makes its money by accruing interest from customers’ uninvested cash balances. It also makes money by charging interest to those with margin accounts – that is, those who want to make the risky move of buying stock with borrowed money. (Margin accounts will be launched on Robinhood later this year.) Robinhood customers are still responsible for paying certain fees on all stock sales charged by the U.S. Securities & Exchange Commission and the Financial Industry Regulatory Authority (FINRA). These typically amount for little more than a few pennies per executed sell. There is no minimum deposit required to use Robinhood – you can easily use it to buy just one share of stock at a time whenever you get your paycheck. You do need to be a legal U.S. resident to use Robinhood, you need a Social Security Number and you need to be at least 18 years of age. Custodial accounts for minors, Robinhood says, are coming soon. We at Techlicious hope so — this app makes a great way for teaching kids and teens a little bit about how the market works. 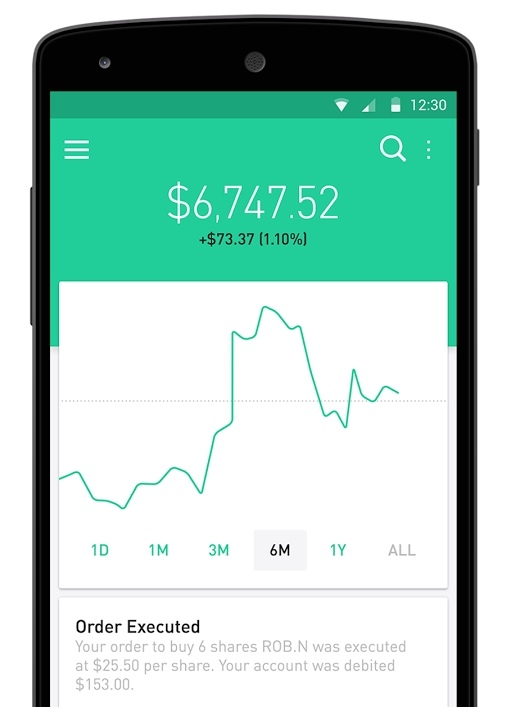 You can download the Robinhood app for iOS on the Apple App Store and for Android on Google Play. To learn more about Robinhood itself, visit the brokerage firm’s website. I’ve been waiting for this to come to Android for the longest time! I was on the iOS waiting list and got approved before I realized they had no Android version. Definitely need to transfer my Merrill Edge accounts over ASAP. Thanks for the heads up! !